The Belfast Sink has been around for a long time and they are as practical today as ever. They are naturally easy to clean, very resistant to stains and their very big bowl means they are still popular- after all, with the advent of dishwashers its invariably the larger items that end up being hand washed in the sink. 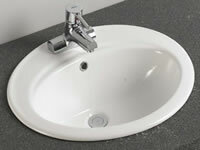 Although many Belfast sink units contain a single 'chamber', a very common variation is the Double Belfast Sink. These sinks have two 'chambers'. Traditionally, one sink would be used to wash the dishes whilst the other sink would be used to rinse them before drying. Most butler sinks are still made to imperial sizes, although there are a few that are in metric sizes (the majority of kitchen manufacturers produce cabinets in metric sizes). Belfast sinks usually come as a 2 foot size (24inches). The metric size is 595mm. More recently, the Belfast sink has become available in 3 foot size. These measurements however, are far from exact - the sinks are hand made and are fired in a kiln. As a result, the actual measurements of the Belfast sink can vary by up to 3%. We are always trying to add more information to this site, so if you have any photos, stories or articles please send them to us - we will be more than happy to incorporate them into the site. History of the butler sink and belfast sink? One of the questions we are often asked is, what is the difference between a Belfast sink and a butler sink, and the answer lies in the history of the Belfast sink, and indeed, the history of Belfast. The Belfast butler sink has what is known as a Weir overflow built into it. Compare this to a London sink which does not have the overflow. The reason behind this is that when the Belfast sink was first produced, Belfast had a plentiful supply of water and wastage was not a problem. At the same time, there was a shortage of water in London, so they were designed in such a way as to minimize any possible wastage. If you have any more information on the history of the Belfast sink, please e-mail us and let us know. If you have other ideas on the history of the belfast sink or the history of the butler sink, we would be happy to add them to our site. Ian Mawson contacted us recently with his thoughts on the issue. According to Ian "The butler sink was used exclusively by the Butler as it was his job to wash the glass crystal and decanters etc. If these were washed in a Belfast Sink then there was a good chance of breakage. With the sink being lead lined this was minimised." A big thanks to Ian for this valuable contribution. If you have any other ideas please let us know. The Belfast sink is made of hard enamel and although they are generally very hard wearing, over time they will age and show cracks. These cracks are the perfect breeding ground for germs, and the time will eventually come when it is no longer practical for use as a conventional sink. When this happens, it’s time to introduce your Belfast sink to the garden! For some people, the very thought of putting a Belfast sink in the garden is offensive, however, for an old battered-out Belfast sink, the garden can be the perfect way to give your sink a second lease of life. If you do not already have a Belfast sink, don’t panic. You can pick them up on E-bay for less than a tenner!